The Cascades offer an amazing array of options when it comes to different mountain sports. And Spring is the best time of year for multi-sport days. We may not have the fluffiest powder, fattest blue alpine ice, or cleanest white granite, but we have some of everything, so Spring is an amazing time to take advantage of the area’s diversity with single-day outings which combine several different activities on adjacent peaks. Whether you are looking to combine splitboarding with some alpine rock scrambling, you want to swing tools on alpine ice amidst a ski tour, or you’re seeking hard granite face climbing followed with a steep couloir descent to the car, May is the prime month for multi-sport days in the Cascades, as well as the Sierra and the Rockies. And since this time of year is typically before most climbers (and all mosquitos) have gotten into the swing of activity up high, you’ll find blissful solitude to match the long daylight hours. In May of 2014 I enjoyed a fantastic combination of moderate classics in Washington’s Stuart Range. A friend and I climbed Dragontail Peak’s Triple Couloirs route (2,500′ 5.7 AI3) and Prusik Peak’s Solid Gold (400′ 5.11a) combined with a ski descent across the Enchantments plateau from Dragontail, and a second ski descent down Aasgard Pass and across Colchuck Lake. 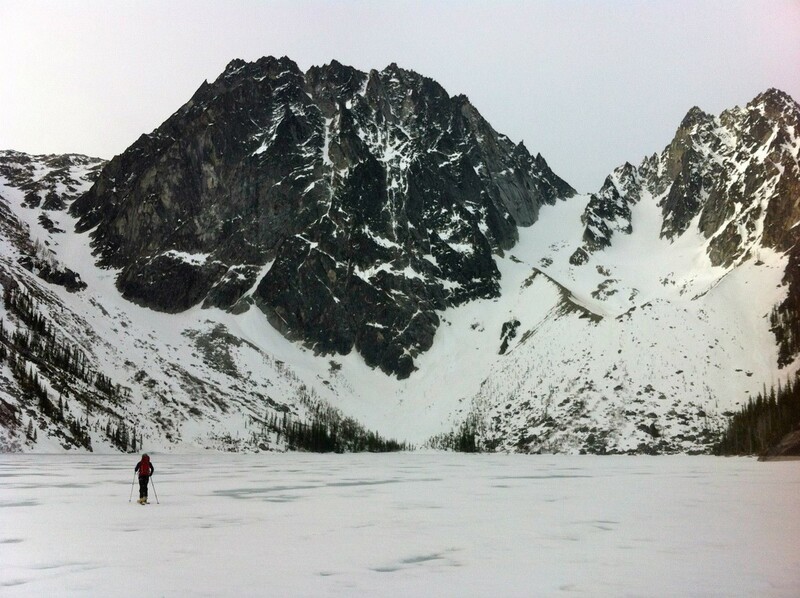 We wore our tennis shoes from the car to the edge of the frozen-over Colchuck Lake and left them there in the morning, donning our ski boots to skin across the frozen lake. We did the majority of the day’s activities in ski boots, including a snow/ice “winter” climb on a big north face. The recent advancements in lighter and more comfortable ski boots (which remain crampon-compatible) have made technical climbing in them easier and lighter than winter climbing in the dedicated climbing-specific boots from a few decades ago. We left ski gear under Solid Gold, the rock route, and went up and down Prusik in rock shoes. A similar approach is perfect for the Washington Pass area where you can skin directly to the base of the climb, or for skiing to the Acid Baby or Valkyrie routes on Aasgard Sentinel. Since most major alpine routes in the Cascades and abroad require a wide-ranging skill set, spring is the perfect opportunity to explore our local diversity while honing each of these individual skills on its own. Connecting these in a linkup is the natural choice, with spring snow cover allowing for rapid transport between objectives. It’s also just an incredibly fast and fun way to explore the mountains and beat the mosquitos into your favorite alpine area.